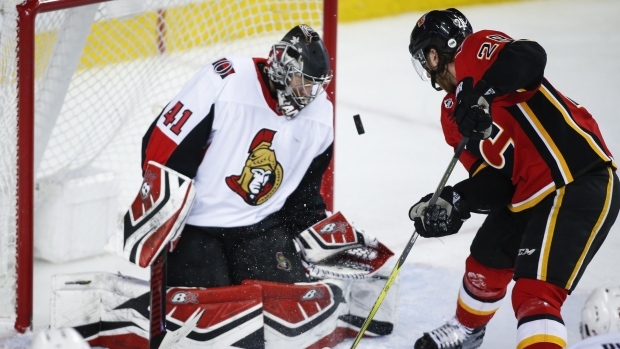 Calgary's fourth-line forwards were feeling chemistry in a 5-1 win for the Flames over the visiting Ottawa Senators on Thursday. Andrew Mangiapane, Garnet Hathaway and Derek Ryan combined on Calgary's second and third goals of the night. Mangiapane and Hathaway both scored and each had an assist, while Ryan assisted on both goals. "They're tenacious," Flames head coach head coach Bill Peters said. "That line is doing everything right. In all three zones, they're doing things right." Captain Mark Giordano scored Calgary's league-leading 18th short-handed goal. Matthew Tkachuk had a goal and an assist and Mikael Backlund also scored for the Flames (46-21-7). Mike Smith made 18 saves for the win in a game pitting the top team in the NHL's Western Conference against the East's basement-dwellers. Calgary opened up a five-point gap on San Jose atop the Pacific Division, with the Sharks falling 4-2 in Los Angeles against the Kings. Both the Flames and Sharks clinched playoff berths earlier this week. Dylan DeMelo gave the Senators (25-43-6) a brief 1-0 lead in the first period. Craig Anderson turned away 31 shots in the loss. Ottawa dropped to 3-6-1 since head coach Guy Boucher was sacked and Marc Crawford took over March 1. "Personally, I didn't think Calgary didn't play a great game, but they played the right way," Crawford said. "They stop in the right places, they move the puck the right way, they support each other the right way, and their fundamentals stopping at the net at both ends are something that we've got to get to. "We still make a few too many mistakes both on possession and turning the puck over in inopportune places." Mangiapane scored his second goal in as many games, wristing Ryan's cross-ice pass over Anderson's glove nine minutes into the second period. Mangiapane started the season with Calgary's AHL affiliate in Stockton, Calif. The 22-year-old from Bolton, Ont., has seen his ice time increase in the last six weeks as he and his linemates have become key contributors at both ends of the ice. "It helps when you're playing with two great guys and building up chemistry," Mangiapane said. "Every day you've just got to keep proving yourself though. I think I belong here, but it's still a day-to-day job. Work hard in practice, work hard in the game and good things will happen." Mangiapane, Ryan and Hathaway capitalized on an Ottawa turnover in Calgary's zone in the first period. The trio rushed puck up ice for Hathaway to finish with a tap-in and a 2-1 lead. "It was a pretty play and I was lucky enough to be at the end of it," Hathaway said. "Pretty much whenever we're on the ice, we know what the right play is. "We're not guessing. You don't have to guess where the other guy is going to be. You don't have to throw away the puck. You can control it. You get a little more confidence as you do that and can build off it." Giordano's short-handed goal that pulled Calgary even in the opening period was his seventh point in six games. Ottawa's Bobby Ryan lost the puck in the neutral zone for a Giordano breakaway. Anderson made the initial save, but Giordano jabbed the puck over the goal-line. "I felt I had to swing my legs out just to make sure I didn't slide into the net with the puck," Anderson said. "He's just there to whack in a free puck. "We shouldn't be giving up breakways on power plays. That's kind of the way things are going for us." Notes: Sean Monahan (illness) and Sam Bennett (upper-body) injury to Calgary's lineup after missing two games, but Bennett did not play the third period . . . Ryan earned his 100th career point with his first assist . . . Giordano moved into second in all-time games played as a Flame (827) behind Jarome Iginla (1,219) . . . Senators forward Jean-Gabriel Pageau served a one-game suspension Thursday for boarding Canucks defenceman Ashton Sautner the previous evening.